The AM-1 with Temperature Gauge allows for a fast & reliable way to complete installation, checkout and troubleshooting systems. 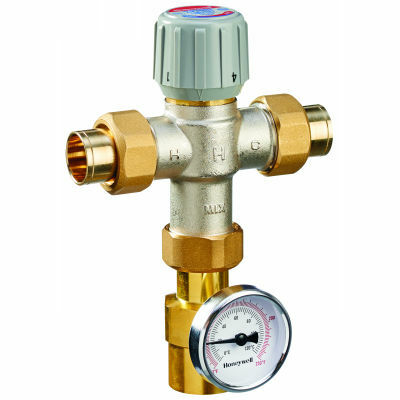 The Honeywell AM-1 Lead Free accurately adjusts, maintains and limits the hot water temperature to a desired setting selected by the user. In domestic water applications it offers scalding protection and bacteria growth control. By installing a Honeywell AM-1 mixing valve and raising water heater storage temperature setting and limiting mixed outlet water temperature to safe temperature more usable hot water is available. In heating applications it provides comfort and protects the equipment. Teflon® coated spool and body to prevent mineral buildup and extend life.